The purest form of evil has taken shape in Storybrooke, and the heroes keep striking out. Everyone is feeling down and out from the Evil Queen’s reign of terror. In “Heartless,” she is making it personal again by going directly after the one part of her revenge plan she has yet to accomplish. You thought you had heard the whole beginning, middle, and present of Snow White and Prince Charming’s love story, but think again! Because the writers had a hidden trick up their sleeves. It turns out that Snow and Charming had a different first meeting, yet neither realized that they were both involved in an odd chance encounter until a magic love sapling revealed the memory. It was interesting to see an alternate start to their path to the truest of loves, and it was quite unexpected. It was a nice gem in the sea of darkness that is overtaking Storybrooke. As with the other six episodes this season, the Evil Queen is looking to cause as much trouble as possible and rule the town. She hasn’t revealed a clear plan of torment and torture, so the act is starting to feel stale. However, I really liked the particular brand of dismay that she brings to town this week. Not only does the Evil Queen have a really good plan this time, but she’s able to execute at a level that she hasn’t previously achieved. I know we’re supposed to root for the heroes, but sometimes it’s nice to enjoy the other team’s success while it lasts. The Evil Queen drives the entire town crazy with the threat of releasing a vial of water from the River of Lost Souls on them if Snow and Charming don’t turn over their hearts to her. It seems ridiculous, but the delivery was pretty great. The Evil Queen struck deep fear into everyone’s hearts, destroyed every tiny bit of hope, and managed to release the best curse yet. 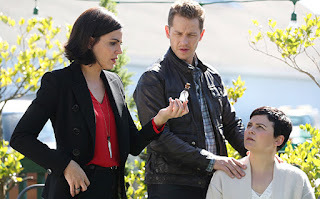 Instead of using a normal sleeping curse to torture poor Snow, the Evil Queen puts a brilliant twist on the old charm. This time around, when Snow or Charming is awake, the other is under the sleeping curse. It’s kind of funny when you see it, but maybe I’m a little too cynical. Next week will definitely focus on the rest of the gang attempting to find a way to break the new curse, considering the usual trick of true love’s kiss only manages to put the other person to sleep. It’s actually a clever twist, and the heroes could use it to their advantage if they are smart. I’m sure there will be some extremely obscure way to break the curse, but I hope it lasts a few episodes in order for a deeper storyline to exist.